This type of error can have many causes, but, in general, it can be solved in a few steps. Below, I present related information about the possible sources of this error and the most common solutions. Domain name system (DNS) is the system responsible for the conversion of alphanumeric domain names into numeric IP addresses. The assignment of names is decentralized in globally distributed DNS servers. Thus, each Internet address written in the search bar of the web browser is sent from the router to a DNS server. This translates the domain name into a sequence of numbers and sends back the corresponding IP address. If the response from the DNS server fails, it will not be possible to access the web page, and the error message “DNS Server is not responding” will appear. The cause of this annoying error message may be a network failure. This means that the DNS server is temporarily unavailable. To check if the web browser generates the connection problem, you will have to test the desired web page using other browsers. Among the most common options are Mozilla Firefox, Google Chrome, Microsoft Edge and Apple Safari. In case the error disappears after trying a different browser, I recommend adjusting the settings of your current browser, as well as checking that you are using the most recent version. It may also be useful to uninstall the program and reinstall it again. If changing the browser doesn’t give any results, another of the most frequent causes of this error is the Windows Firewall. 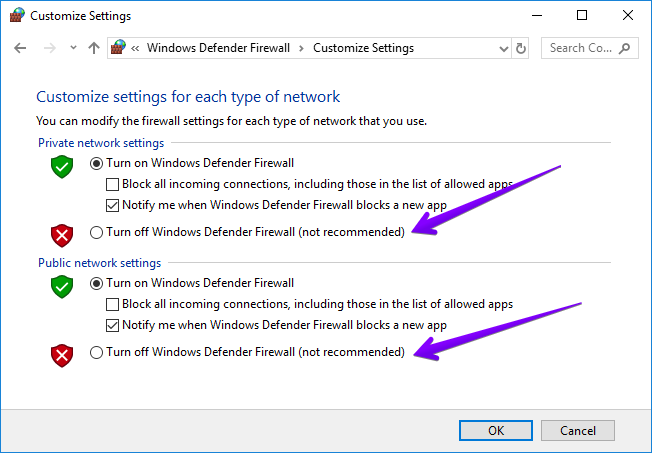 Check Turn off Windows Defender Firewall in both private and public. If even disabling Firewall the error remains, you will have to focus your efforts on your DNS configurations. Usually, Internet connection problems can be solved by restarting the router. For this, it will only be necessary to press the corresponding power button. A slightly more abrupt option is to disconnect the power source. In this case, its necessary to wait around 30 seconds until all electronic components have completely turned off before connecting it again. If, despite restarting the router, the message “DNS server not responding” still appears, it will be necessary to choose a different DNS server. If common sources of error such as a router error or a conflict with the Windows Firewall have been ruled out, the next step will be to change the DNS server. With just a few clicks you can replace your DNS server with your own servers. One of the alternatives are the public DNS servers. One of the fastest, free and trusted DNS servers is the public server operated by Google . 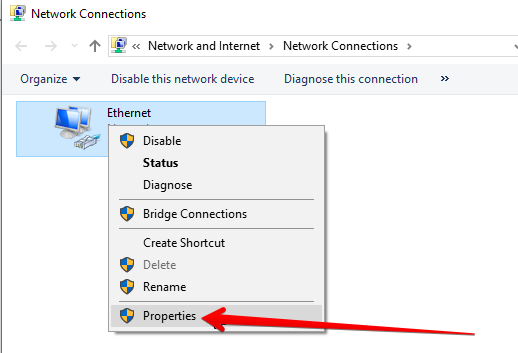 To set up the DNS in Windows 7, Windows 8 or Windows 10 you must access the network adapter settings. In this part, you must select the Internet adapter. If you use WLAN to connect to the Internet, you will have to choose the wireless or Wi-Fi adapter. If you connect with a LAN adapter, then select the Ethernet Adapter. Now you must choose the corresponding Internet protocol. Among the options are the 4 and 6 version. In most cases, the “Internet Protocol version 4” is the one. So double-click on it. Now it will be possible to change the DNS server address in Windows. 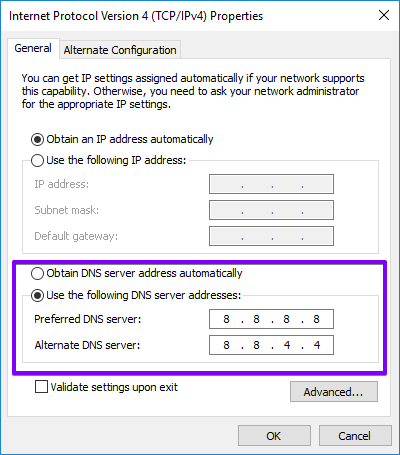 The options “Obtain an IP address automatically” and “Obtain DNS server address automatically” will always be check by default. 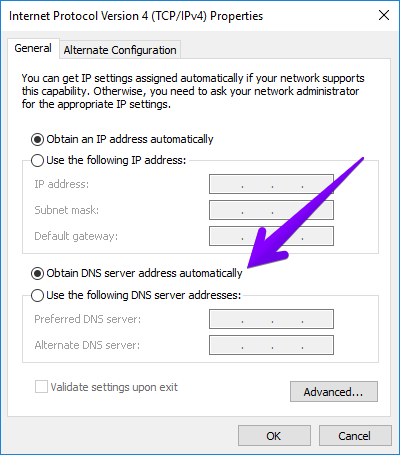 To change the DNS server address manually, click on “Use the following DNS server addresses” and enter the address you want. If, for example, you want to use Google’s DNS server, copy the address 8.8.8.8 in the “Preferred DNS server” field and address 8.8.4.4 in the “Alternative DNS server” box. By clicking on the OK button, you will confirm the changes made to the DNS server. Another alternative to change a DNS is using the PowerShell. This method is aimed more at experienced users. With just one command it is possible to configure the DNS without having to make many clicks. To do this, open PowerShell as an administrator. 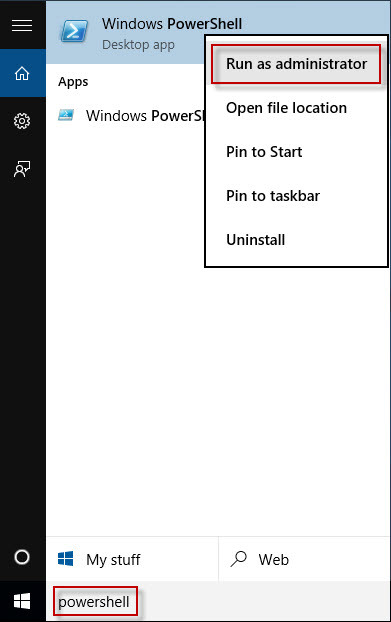 Type the word “PowerShell” in the search box and right-click to select the option Windows PowerShell and then Run as administrator. Here you must also replace Wi-Fi with the name of the adapter used 8.8.8.8 and 8.8.4.4 are the public addresses of the Google DNS server. Configuring DNS in Prompt is a process aimed at users with extensive experience in Windows management. As with PowerShell, this method doesn’t require the use of any user interface, being especially suitable for the maintenance of a server. The first step is to open the Command Prompt as an administrator. Windows does not issue error messages in case the names don’t match or are incorrect, so try to make sure that the interface name is correct. To determine if the error “The DNS Server isn’t responding” has been completely resolved, you can perform a simple test. Enter any URL in your browser, for example, https://www.google.com. If you immediately access the Google website, the DNS server you have registered will be working correctly. Otherwise, you can enter the IP address 172.217.16.195. This is one of the many IP addresses on the Google website. If after trying with both options, you still don’t see the web correctly, its probably not a problem with your DNS server, but with your Internet Connection.